Unmanned Aerial Vehicles (UAVs) are able to fly for 20 or more hours deep inside foreign territory. It bears a wide array of sensors, radars and surveillance cameras to monitor certain activities. But, behind those operations are remotely controlled by the military ground station. Inside this UAV command centre is a numerous set of computing technology operated by highly-skilled military personnel. Each workstation bears industrial-grade PCs where the real-time data coming from the UAVs are recorded. It also has a system that provides the required information by the specific operator’s task. This means that installing an industrial computer is best considered for military UAV operations. It can have the required operating system such as Windows and Linux. This is to ensure that it can perform complicated applications including UAV ground control station. Now, how can this device functions well in UAV operations? What are the capabilities of this device that can be utilised and improve critical military ops? Understand why an industrial panel PC is a great option. UAVs or simply known as military drones have been providing support to military operations. These unmanned aircraft operate in a clear line-of-sight to the ground data terminal antenna. At the same time, it has a satellite link that receives an over-the-horizon communication. And, both of this functions are monitored at the ground control station. Now, a ground control station has a challenging environment. Apart from its complex application, it must have a secured and anti-breach system. Good thing is, an S22 embedded panel PC can have the required specifications and features needed for ground control station. This device comes with an Intel® Core i7-3610QM 2.30GHz Quad Core motherboard processor with LED backlit displays. This feature has the capability to perform multiple and complex applications. Therefore, applications such as anti-breach and anti-hacking can be installed and utilised on this device. Can this device adhere such a challenging working condition? Let us take a look at some of the best features of S22 military computers. In reality, only a few people know how these drones actually work; although some may be aware that is remotely controlled. Here are a few glimpses of how the 22” military PCs are deployed and utilised in various military missions. Amongst the most important qualities to look for a military PC is the capability to withstand a wide temperature range. An S22 industrial computer features an ambient operating temperature from 5°C to +45°C. Its optional extended temperature ranges from -30°C to +50°C. This means that it can perform its functions well even with the presence of shock, vibration and heat. Note that a UAV command centre has a limited workspace. So, it would be ideal to have a computing equipment that can fit in its space. The 22” embedded computing device can have a rackmount system. This feature makes it easy to keep things neat and orderly including cable management. Thus, it is space-efficient. But, rest assured it can still perform its specific functions effectively as well. Every operation requires specific and adequate features for a successful operation. Royal Navy needs a custom-configured PC specifically for submarine use. Whilst, Marines require broader requirements depending on where the device is going to be deployed. This goes similar to UAV ground control station. Now, this S22 rugged computer displays can also have a custom configuration option. It can have the features needed for surveillance operations of UAVs or for a more critical mission. Expect that this device can be a viable computing system in terms of specific needs. Technically, rugged industrial PCs used in military operations are considered the standard in terms of maximum durability and high-performance features. It must have the characteristics required for a demanding application such as military UAV operations. Also, this device must have the capability to provide secure computing and communications. And, lastly, it must offer an ease of use as well. Hence, installing the 22” industrial computing device should be the best option. 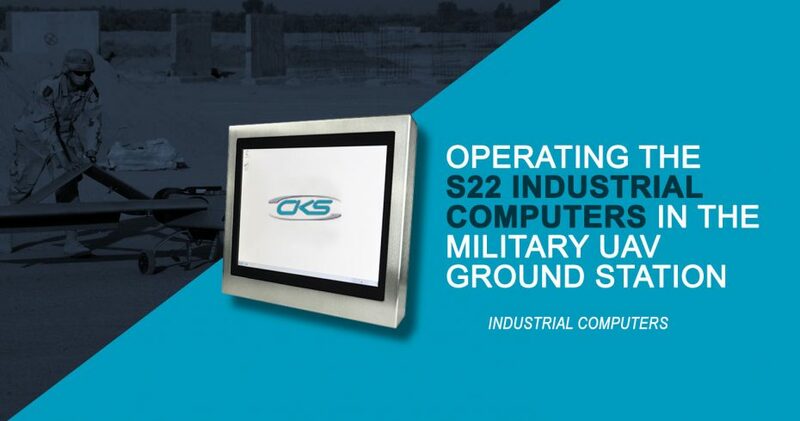 Find a reliable industrial computer manufacturer today and opt for an S22 industrial computer display for UAV command and control station.